Saeed A. Khan is a Senior Lecturer in the Department of Near East & Asian Studies and Global Studies at Wayne State University-Detroit. 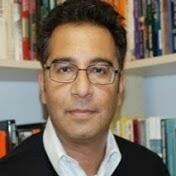 Mr. Khan is also a Research Fellow at Wayne State University’s Center for the Study of Citizenship, and Honorary Fellow at Australian Catholic University. Mr. Khan has been a contributor to several media agencies, such as C-Span, NPR, Voice of America and the National Press Club, as well as newspapers and other outlets, and is also a consultant on Islamic and Middle East affairs for the BBC and the CBC. Q1: How is Islamophobia being capitalized on by anti-Muslim activists, elected officials, etc., to pass restrictive policies and measures that limit the rights of other populations in the United States? Across the United States, sponsors and co-sponsors of anti-Shariah legislation are highly likely to be involved in offering legislation that restricts Americans based upon their religion, ethnicity, race, immigration status, gender, sexual orientation or labor union affiliation. These take the form of bills that severely restrict a woman’s right to reproductive healthcare, dismantle union membership, restrict the rights of the LBGTQ community or offer bills that apply unreasonable conditions for voter access to the polls (e.g. voter ID laws). In 2013, for example, North Carolina proposed SB695, ostensibly an anti-Shariah bill. Shortly before the floor vote, an amendment was attached that had some of the country’s most restrictive provisions affecting a woman’s access to reproductive health care. The North Carolina case demonstrates the coordinated strategy to target and marginalize several populations and their civil rights. As the public protests against anti-Shariah bills remains generally minimal and ineffective to prevent their passage, activists and politicians use such legislation to conceal other political agendas that affect other communities. Q2: How do anti-Sharia Law bills increase the mistrust, fearmongering, and othering of Islam and Muslims? The anti-Sharia bills are enacted by politicians who want to demonstrate that they are on the vanguard of erecting preemptive firewalls against a purported foreign threat from within the country. Of course, it is predicated upon the false premise that Muslims are in fact seeking not only to have Shariah implemented, but that Shariah is somehow incompatible and threatening to the US Constitution and even the entire American judicial system. Oftentimes, Shariah is accused of being a ‘Trojan Horse’ whereby Muslims will first seek the implementation of its more benign elements and then slowly seek to subvert society by having it codified in its entirety. The fear mongering comes when Islamophobes cite examples of the hudud (corporal and capital punishment) aspects of Shariah as well as the provisions that describe the treatment of non-Muslims who are subject to Shariah. It also creates a chilling effect for Muslims who may seek recognition of some aspect of religious law, e.g. family law, estate planning matters, etc. by the courts in the same manner as religious accommodations are made for other faith traditions, e.g. Get divorce for Jewish communities, kashrut dietary regulations, etc. Q3: How do anti-Sharia Law bills foment a climate of intolerance that increases the likelihood of hate crimes against Muslims and those perceived to be Muslims? The bills normalize the othering of Muslims as well as perpetuating the perception of Muslims as a foreign, incompatible, pernicious element within American society. Legislative action like anti-Shariah bills stigmatize the Muslim community and inadvertently give license to Islamophobes to apply “vigilante justice,” by which those that commit hate crimes feel as though they are deputized to act by the state to enforce the laws that the legislatures have passed in order to “protect” America from this alleged threat. Islamophobes then allege that it is their “patriotic” duty to fight the purported Islamic menace at home. At the crux of such a motivation is a deeply rooted fear that the US is becoming a majority-minority country within a generation and fear that the emerging non-white majority will gain economic, cultural and political power at the expense of the current white majority. In this regard, the underlying xenophobia and hypernationalism that defines America as a White, Christian nation is played out through such hate crimes against Muslims and others perceived as being Muslims.